How much is that Scottie in the window, you ask? You'd be a fool to think I'd say anything other than priceless! You see, Scottie love can't be bought. It is earned...especially when it comes to recycled Scottie love. Most rescue Scotties have already learned to love and unfortunately, to lose. Some are hesitant to love again but with a little time, patience and effort, that big heart in that tiny body of theirs once again opens up. And once you're in, you're in! That rescue Scottie is yours and you, consequently, are his (or hers!). The first night Mr. K spent in my old apartment the day I rescued him, he was somewhat aloof, happily keeping to himself in the comfort of my kitchen. He didn't object to the fact he wasn't sleeping in the same room as me and he didn't even mind the baby gate being up, at first. It almost seemed as if he had come to accept the terms under which he found himself living: the limited, gated area of the shelter, no hooman to call his own and the solitary squeaky tennis ball that served as his only companion. Luckily, he had only been in the shelter for about 17 days - any longer and I'm sure that boy's spirit would have really been crushed. I love Scottish Terriers. That much, I believe, is obvious. But "rescued" is my favorite breed. What I love most is the fact I was given this opportunity to provide Heather and Mr. K the loving homes they deserve and sit back as I watch their faith in humanity be restored. I love them for who they are - Scottie-tude and all - and hope to have the opportunity to open up our home to more rescues one day or at least foster fellow Scotties in need. I already know what it feels like to be greeted by two elated Scotties scrambling for your first pet once you come home; to feel those crazy wagging tails smack up against your ankles so hard; and I've seen that Scottie in the window, sternly looking after you as you go to make sure you make it out okay and happily watching you walk toward the door as you return later that day. All priceless little moments, if you ask me. Try it out for yourself, if you haven't already: adopt a rescue Scottie (or let them adopt you!) and get ready to experience some serious recycled Scottie love! I'm a rescue and I love my peep! A beautiful tribute to the importance of rescuing and of course, to those little scottish furfaces we love so much! Well done- I agree wholeheartedly with all your thoughts! Heather and Mr. K are wonderful Scottie souls to show you what an incredible breed this is! This is why i love your Blog, Scottie Mom!!!! 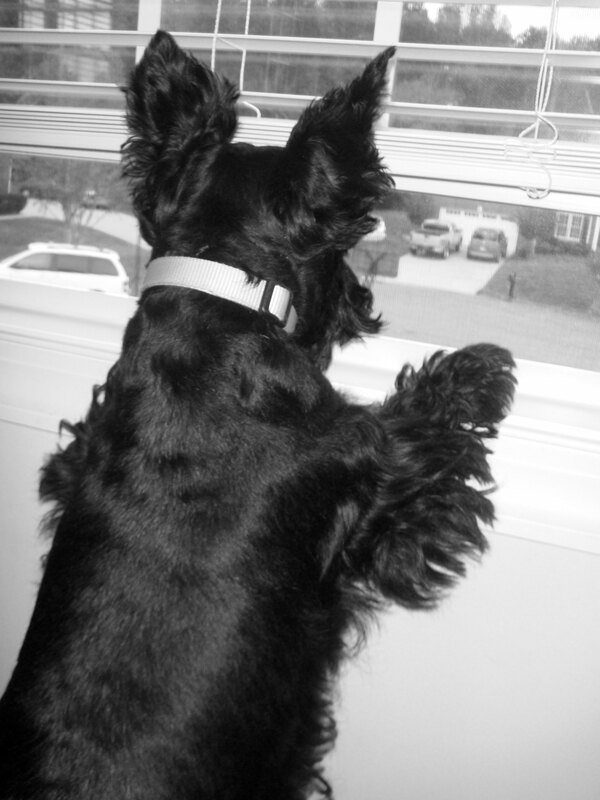 Your stories move me and are so similar to what we experience day after day when having a Scottie pup at home. Mr. K and Heather are blessed little souls, which nourish you with love and affection each day of your life!! Bravo!!!! This particular blog is exactly why I stay connected with you. I could tell from the very first one I read, which, btw I just happened to stumble upon, that you were a true Scottie Mom and, like the rest of us, you are hooked for life! You write from your heart and soul....that is most evident. Mr. K and Heather were so lucky to be chosen by you but I'm sure you would contradict me and say you were the lucky one. Hootie and I hear you....and isn't it nice we all belong to a mutual admiration society?